The type of weather-stripping you choose depends on cost, durability, appearance and installation. All types are fairly easy to install, but some types last longer or are more attractive. Types with adhesive backings are especially popular because they are so easy to apply. Felt is the least expensive weather-stripping material and has the shortest life expectancy -- only 1 to 2 years. It attaches with glue, nails or staples. Doors or windows close against it creating a seal. Besides its short life, its disadvantages are that it can not be painted and should not be allowed to get wet. Reinforced felt has slightly longer life. Adhesive backed foam tapes made of urethane or vinyl have the same short life disadvantage lasting only a year or two, but they can be exposed to moisture. Tubular gasket weather-strip seals as it compresses against the window or door. While it is visible, which can be a disadvantage, it can be painted. Tension strips are the most durable weather-stripping. They are formed in a V shape and work by compressing when the door or window closes on them. Spring metal tension strips are more difficult to install than some other types of weather stripping but, even after years of wear, they can be bent back into shape. Similar to spring metal, but much easier to install, are adhesive-backed tension strips made of vinyl. Rigid strip weather-stripping is wood or metal with a pliable foam edge that can be nailed into door jambs or around windows. While it is easy to overlook, weather-stripping at the bottom of outside doors is critical. Consider that a 1/4 inch gap under a 36 inch door is equivalent to a 9 square inch hole in the wall! There are three primary types of threshold weather-stripping. The easiest but least expensive is the door sweep. It simply screws to the door. Some come with retractable sweeps that raise automatically when the door opens. 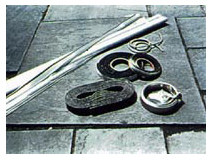 Gasket thresholds or door shoes generally cost a little more and require removing the door and sometimes trimming it. The vinyl insert in thresholds experience wear and may need to be replaced after several years. Door shoes, because they are attached to the bottom of the door, have the advantage of longer life.